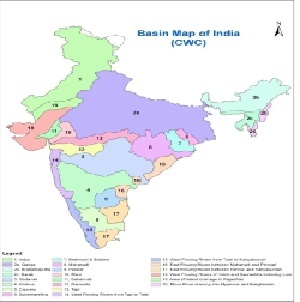 Central water Commission has divided the country into 20 rivers basins comprising 12 major and 8 composite river basins. To address the multi-faceted nature of water management, many countries are now introducing an integrated approach to water resources management at the national and basin level. This includes improving institutional arrangements and working practices. The integrated water resources management approach helps to manage and develop water resources in a sustainable and balanced way, taking account of social, economic and environmental interests. It recognises the many different and competing interest groups, the sectors that use and abuse water, and the needs of the environment. The integrated approach co-ordinates water resources management across sectors and interest groups, and at different scales, from local to international. It emphasises involvement in national policy and law making processes, establishing good governance and creating effective institutional and regulatory arrangements as routes to more equitable and sustainable decisions. A range of tools, such as social and environmental assessments, economic instruments, and information and monitoring systems, support this process. Government of India and Australia have entered into a memorandum of understanding (MOU) in September, 2014 (in continuation of MoU signed earlier in Nov 2009 which expired in Nov 2014) for enhancing cooperation on Water Resources Development and Management through the sharing of policy and technical experiences. The MOU has a validity of 5 years. The work of preparation of IWRM Plan for Brahmani-Baitarani Basin is being carried out under this MoU. The work is being done in collaboration with the Govts of Odisha, Jharkhand & Chhattisgarh and CGWB, NIH, IMD, etc. At the end of the project, it is expected that the officials of the State Govts. as well as the Central Govt. will become conversant with the process of basin planning and the working of the eWater software. Also, the IWRM programme will provide guidance to the State Governments for planning of their water resources in an optimal manner. The project will continue upto June, 2016. There is a proposal to carry out the work of preparation of IWRM plans of 10 more river basins/sub-basins in collaboration with IIT/ CSIRO, Australia.